Tonight Bailey finally joined us as a big girl at the dinner table. 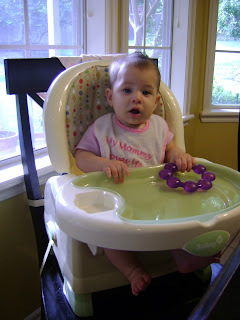 I put together her highchair seat and she sat with us as we ate dinner! I fed her her first sweet potatoes and she loved them! But anything is better than that nasty rice cereal, right? She has had butternut squash and sweet potatoes and is finally getting the hang of this eating from a spoon thing! It seemed like she would never get the majority of the bowl into her tummy but she finally is. I am trying to make all her baby food homemade this time around and with great mommies that have gone before me, I can ask questions and muddle through while I learn how to prepare all of these different foods for a baby! It's actually very easy and I'm mad at myself for not doing it with Avery. I don't know why I didn't. 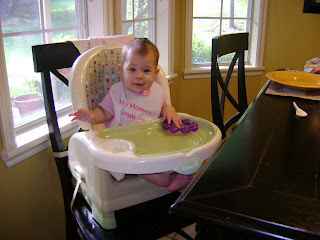 Anyway here's a couple of cute photos of Bailey in her big girl high chair sitting at the table with the family! Yay, Bailey! 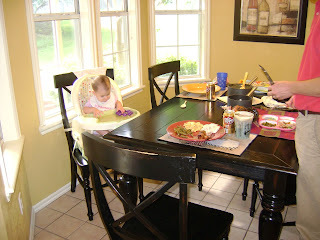 It feels like life is a little more "normal" once baby makes it to the table, huh? Love the new background - do who design it yourself? if so, where? Also, Bailey is so big looking! It goes by sooooo fast.